Professor Greg Bamber is in the Department of Management, Monash Business School, Faculty of Business and Economics, Monash University, Melbourne. Among other roles, he has served there as: Director of Research and as Discipline Group Leader: Human Resources and Employment Relations. He has more than a hundred academic publications including many articles in such refereed journals as: Asia-Pacific Journal of Human Resources; British Journal of Industrial Relations; Comparative Labor Law and Policy Journal; Higher Education Review; Human Relations; Human Resource Management Journal; Industrial and Labor Relations Review; Industrial Relations Journal; International Journal of Human Resource Management; International Labour Review; Journal of Industrial Relations; Journal of Management Studies; Australian Journal of Labour Economics; New Technology, Work and Employment; Personnel Review; Prometheus; Public Administration; Thunderbird International Business Review. 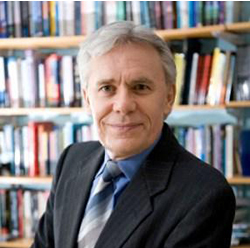 He has also published numerous edited book chapters and books (see publications) including the 6th edition of International and Comparative Employment Relations: National Regulation, Global Changes, edited together with Russell D. Lansbury, Nick Wailes and Chris F. Wright (2016) Allen & Unwin/Sage. It is the standard work in the field. The book, Up in the Air: How Airlines Can Improve Performance by Engaging their Employees (Cornell University Press) has attracted much interest; it is an international study with a focus on strategy, people and employment relations (authored together with Tom Kochan, Jody Hoffer Gittell and Andrew von Nordenflycht). Other volumes that he has published include: Regulating Employment Relations, Work and Labour Laws: International Comparisons between Key Countries (Kluwer) Employment Relations in the Asia Pacific (Allen & Unwin/Thomson), Managing Managers (Blackwell); Organisational Change Strategies (Longman); Militant Managers? (Gower) and New Technology (Routledge/Allen & Unwin). His publications have been widely cited and have been translated into ten other languages. He has served on the editorial board of more than 20 refereed journals. He has served as an assessor for the Australian Research Council (ARC) and also for the equivalent research councils in Britain, the USA and Canada. He has been a co-chief investigator on many competitive grant-funded projects. His international research collaborations include being Co-Leader of projects on: airlines, car manufacturing, hospitals and telecommunications. He was educated at University of Manchester, London School of Economics, and Heriot-Watt University, Edinburgh. He has worked on research projects based at the Universities of Oxford and Warwick and at Imperial College, London University. He was an academic at the University of Durham Business School (Director of Research). He was an academic subsequently in Australia at the University of Queensland (Reader), Queensland University of Technology (Director, Australian Research Council Key Centre in Strategic Management), and Griffith University (Dean and Director, Graduate School of Management). More than a dozen international conferences have selected his papers to be keynote addresses and published as one of the best papers or to be included in proceedings or special issues of journals. He researches and advises international organizations, private- and public-sector enterprises and other organizations. Government departments and international agencies (e.g. the International Labour Organization) have commissioned him to conduct projects. He has also been an adviser for governments in Australia, the UK and other countries. He has been appointed to serve as a director on several boards in the fields of education, sport and health, including the State of Victoria’s Board of Monash Health, which includes responsibility for Monash Medical Centre and associated hospitals. He has been an arbitrator for the British Advisory, Conciliation and Arbitration Service (ACAS). He has served as President of: Association of Industrial Relations Academics of Australia and New Zealand (AIRAANZ); Industrial Relations Society of Victoria; Australian and New Zealand Academy of Management (ANZAM), and of International Federation of Scholarly Associations of Management. He has served also as Co-Chair: International Section, US Labor and Employment Relations Association (LERA). He is a Distinguished Member and Life Fellow of the Australian and New Zealand Academy of Management; and a Fellow of several other associations including: Academy of Social Sciences, UK; Academy of Social Sciences of Australia, Australian Human Resources Institute, Australian Institute of Management, British Academy of Management (BAM), Chartered Institute of Management, UK and of Chartered Institute of Personnel and Development, UK. He has been an Examiner, Guest Speaker or Reviewer for universities and enterprises in Australia, the UK and other countries. He is a Visiting Professor, Newcastle University, England. He has also been Montague Burton Visiting Professor, Cardiff University, Wales and a visitor at several other universities including: Harvard University and Massachusetts Institute of Technology (MIT), USA; University of Melbourne and the University of New South Wales, Australia and at several universities elsewhere. At Monash University he is also a member of the Australian Consortium for Research in Employment and Work (ACREW), part of the Centre for Global Business, Monash Business School; the Monash Asia Institute; and the Monash European and EU Centre: a joint undertaking of the European Union (EU) and Monash University.